In the village of San Marino di Bentivoglio, 15 kilometres from Bologna. 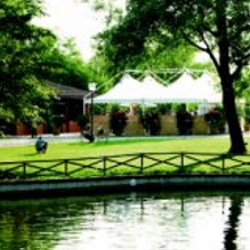 In summer time you can eat outdoors, protected by a large gazebo with the view that runs to the pond in the park of Villa Smeraldi, in a peaceful green oasis of the Bologna's plains. Villa Smeraldi is home to the Museum of rural culture, immersed in a reality that tells of work and life in the countryside between 19th and 20th century.